Consumers around the world would rather spend money on brands that take a stand on issues over companies that shy away from controversy, according to a study released Tuesday. Sixty-four percent of respondents to the 2018 Earned Brand study by public relations firm Edelman said they are buying from or boycotting brands based on the company's stance on a social or political issue. The survey says "belief-driven buyers" are deeply connected to these brands and are more willing to buy their products, stay loyal and defend them than the average consumer. The survey included responses from 8,000 people in 8 countries, including the U.S., U.K., Germany and Japan. "[Consumers] want to buy on beliefs. They want brands to stand up on issues that matter to them. Two-thirds literally say, I will buy a brand or I will boycott a brand if they stand up on issues," CEO Richard Edelman told CBS News. The survey found that "belief-driven buyers" were the majority in every market, age group and income level surveyed. Sixty-seven percent of respondents bought a brand for the first time because of the company's position on a controversial issue, and 65 percent said they would not buy a brand because it stayed silent on an issue it had an obligation to address. 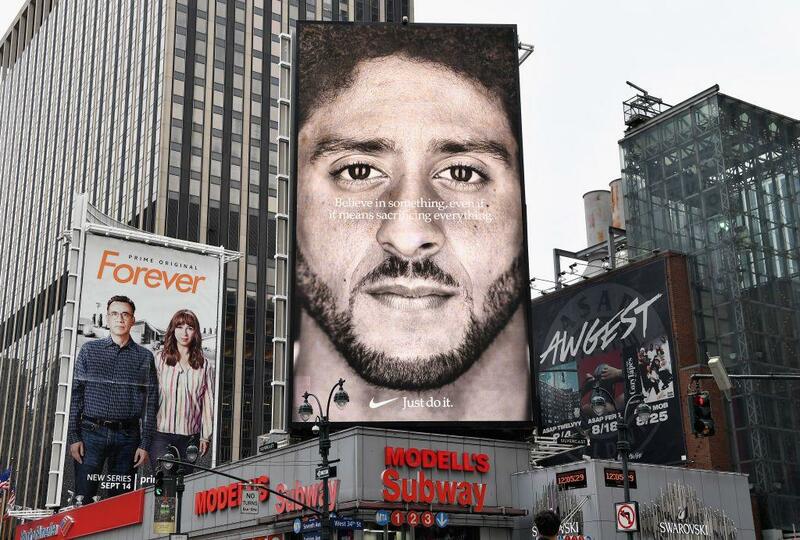 Nike recently stirred controversy by signing a new endorsement deal with former San Francisco 49ers quarterback Colin Kaepernick, whose decision in 2016 to protest against racial injustice during the national anthem kicked off a nationwide debate. Despite some backlash, Nike shares surged 36 percent on the year by late September, with the company adding nearly $6 billion to its market value since announcing Kaepernick joined the "Just Do It" campaign. "Brands and corporate reputation are inextricably linked, that's a new phenomenon, and it has to be authentic. But the corporation is being asked broadly to step up and speak up," Edelman said. "Two-thirds are expecting CEOs to stand up and speak up and not wait for government. It is both the c-suite and marketing." More than half of respondents said they believe it's easier for the public to push brands to address social issues than governments, and 53 percent said brands can do more to solve issues than governments can. Sixty percent of those surveyed said brands should make it easier for buyers to know their positions on important issues. Edelman said this is an important trend that is here to stay because business is the "most trusted institution in the world." He said brands are typically looking to embrace middle-of-the-road causes rather than ones that align with progressives or conservatives. "They are looking to improve how people look at women or access to education. Issues that need resolution and brands can play a fundamental role," he said. Tanya Rivero contributed to this report. Full disclosure: Edelman represents CBS News in public relations matters.